Event attendees Cathy Dickey, Tana Herrington, Jacquie Dorrance, Susan Palmer-Hunter and Maria Jacobs. Photo by Haute Photography. I am one of the newest members of the board of Ballet Arizona, and I never cease to be amazed by all I learn and experience through my involvement with this organization. The Opening Night Reception for Topia was no different. Topia is a ballet bringing together the beauty of dance and nature in a way I have never experienced. 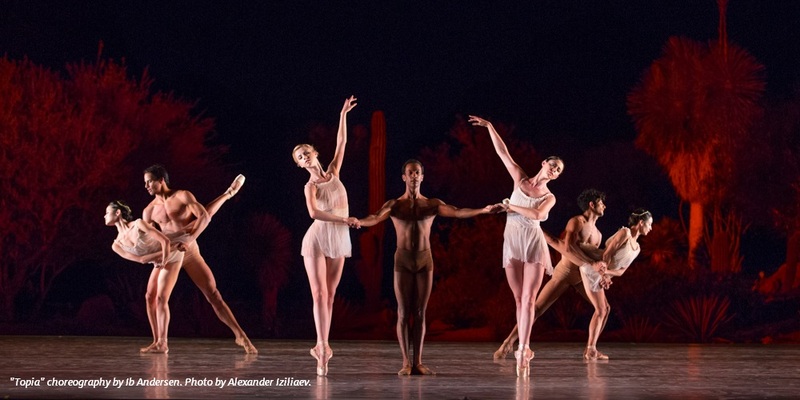 Artistic Director, Ib Andersen, and his company have shown us ballet in a new light with a performance at Desert Botanical Garden. Prima Circle member Stacy Gould with Artistic Director Ib Andersen. Photo by Haute Photography. 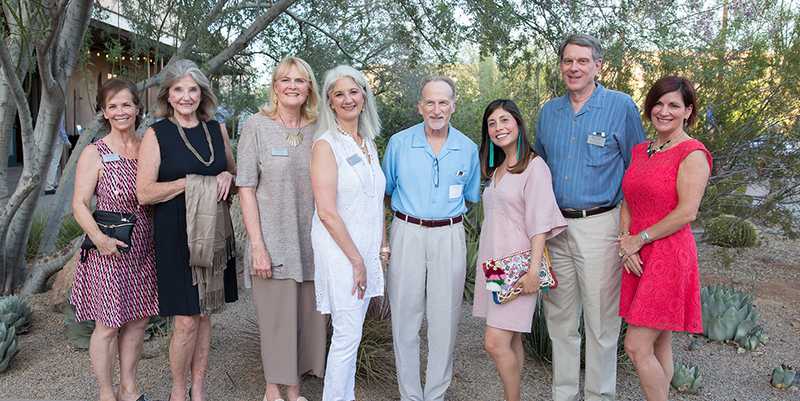 The evening began with a Prima Circle member reception in the Boppart Courtyard. This event is one of my favorites because so many of my fellow fans of ballet attend with an enthusiasm and excitement about the performance to come, and a feeling of celebration for the closing of a season well done. 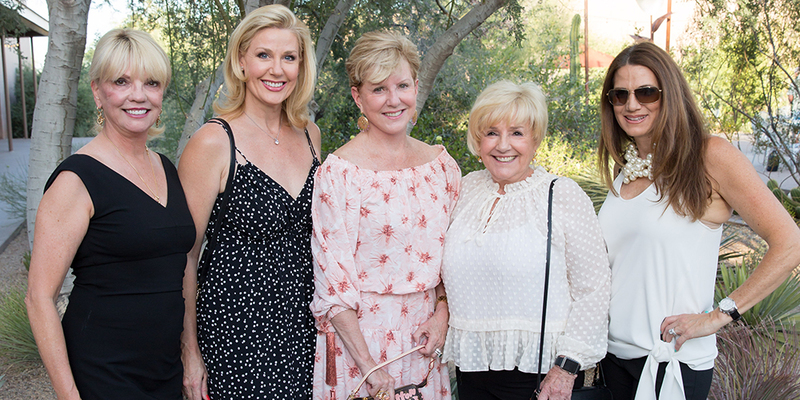 Attendees enjoyed delicious hors d’oeuvres, wine and cocktails, and a chance to mingle with the many guests, including former board members who helped grow Ballet Arizona into what it is today, as well as new patrons experiencing a performance for the very first time. BAZ’s Incredible Prima Circle Committee: Joan Berry, Adrienne Schiffner, Susie Fowls, Kate Groves, Jim Smith, Miranda Lumer, Jim Heffernan and Betsy Curley. Photo by Haute Photography. The evening continued with remarks from our fearless leader and Executive Director, Samantha Turner, who spoke about her gratitude for the generous support Ballet Arizona has received this season and her vision for the future of Ballet Arizona. Ib then provided insight into his revolutionary ballet. “Topia”, choreography by Ib Andersen. Photo by Alexander Iziliaev. And then we arrived at the main event! Topia is performed on a stage spanning eighty feet wide set against the backdrop of the Papago Buttes and beautiful desert wildlife. The performance was stunning for many reasons, but one particularly remarkable part was the use of the setting sun to add drama and depth to the performance, at one point making the dancers appear as if their bodies were made of gold. Topia is unique because Ib and costume director Leonor Texidor have kept the costumes elegant, but simple, allowing the audience to be enchanted by the complexity of the movements and the smells, sights, and sounds of the desert. As one guest commented, “You can’t get more Arizona than this!” I could not agree more. Arianni Martin & Helio Lima in “Topia”. Choreography by Ib Andersen. Photo by Alexander Iziliaev. I was most touched by the fun the dancers had while performing this piece. It was evident on their faces, and was contagious for the crowd. I know I am not alone when I say Topia is the perfect end to a successful and engaging season! 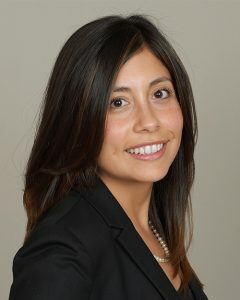 As an estate planning attorney, now working in the financial industry, my day to day activities are largely numbers driven. And, though I enjoy my job very much, I am grateful for the opportunity to switch gears by serving as a member of Ballet Arizona’s board. Ballet Arizona has always held a special place in my heart and mind because of the depth of talent in the company and the artistic vision brought by Artistic Director, Ib Andersen. My passion for the ballet has only increased through my Prima Circle membership because of the behind-the-scenes access, insight into performances through interviews with Ib and the dancers, and special receptions. As an Arizona native, I have seen Ballet Arizona grow and evolve over the years and I am proud to call this company my ballet family. Loved reading this, Miranda! Thank you so much for being a big part of our BAZ family. Hi Miranda, I think you captured the evening quite nicely and elegantly. Thanks for doing this. It was a great evening and performance! I also enjoy the receptions, and meeting fellow ballet enthusiasts. Your article captured how every attendee feels about this performance. No where else can it be seen. Great job Miranda. You captured the magic of the evening.